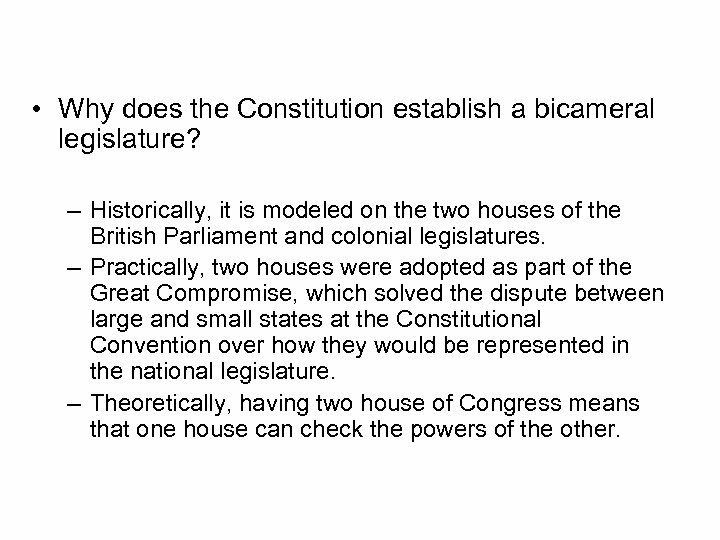 Introduction • Why does the Constitution establish a bicameral legislature? – Historically, it is modeled on the two houses of the British Parliament and colonial legislatures. – Practically, two houses were adopted as part of the Great Compromise, which solved the dispute between large and small states at the Constitutional Convention over how they would be represented in the national legislature. 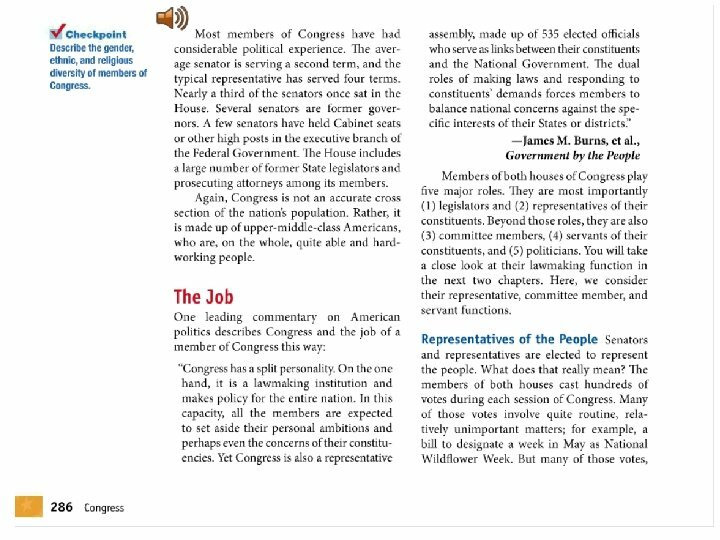 – Theoretically, having two house of Congress means that one house can check the powers of the other. 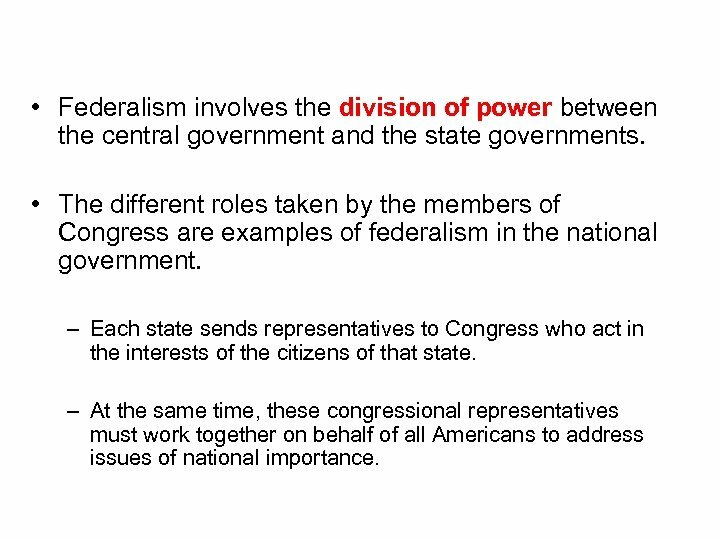 Congress and Federalism • Federalism involves the division of power between the central government and the state governments. 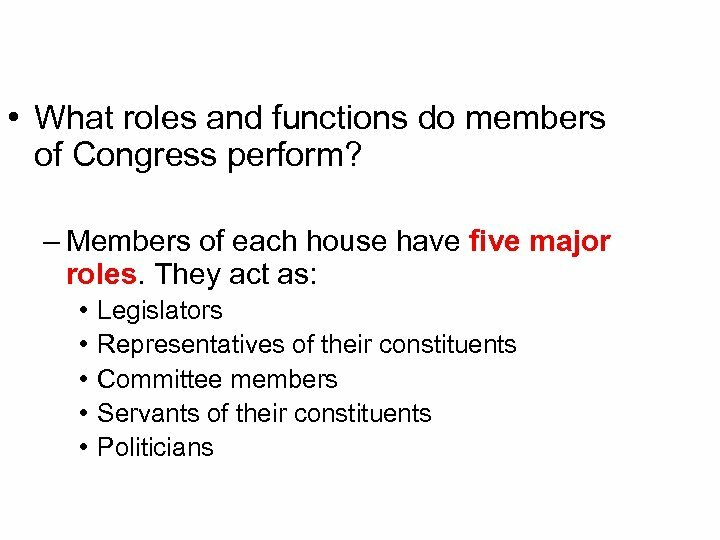 • The different roles taken by the members of Congress are examples of federalism in the national government. – Each state sends representatives to Congress who act in the interests of the citizens of that state. – At the same time, these congressional representatives must work together on behalf of all Americans to address issues of national importance. 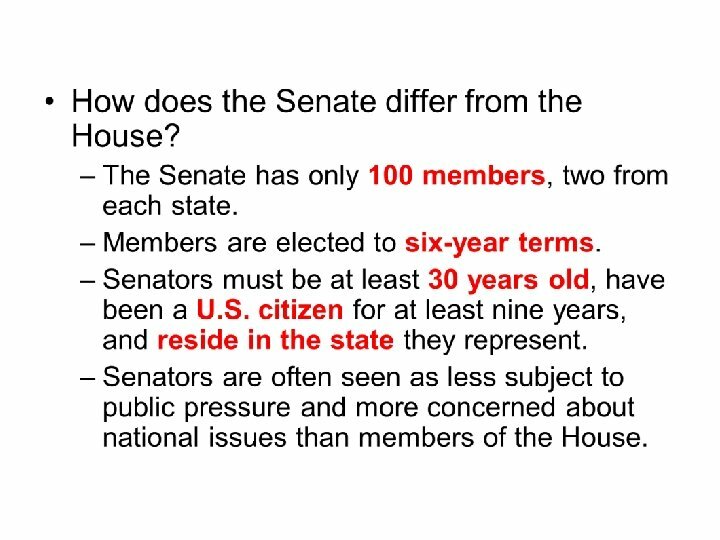 Representation • Each state is equally represented in the Senate and represented by population in the House. 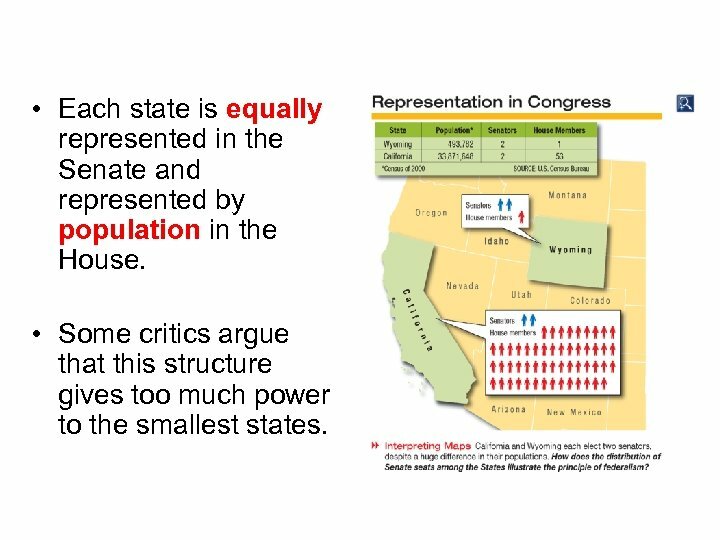 • Some critics argue that this structure gives too much power to the smallest states. 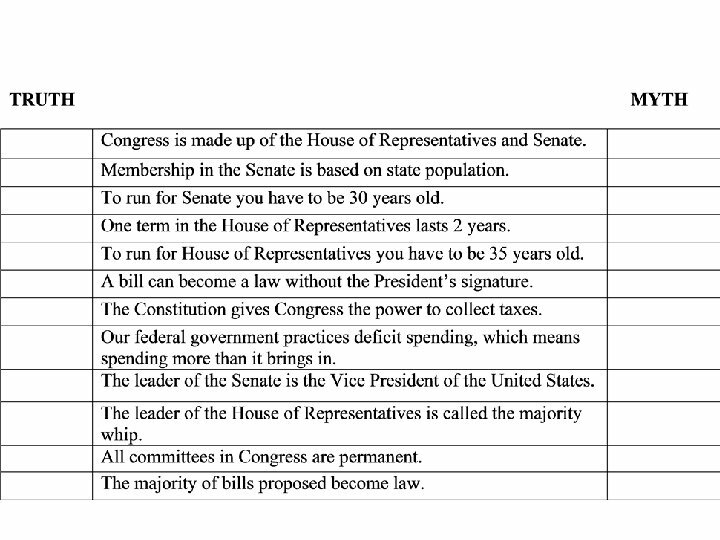 Congressional Terms • Beginning in 1789, Congress has met for two-year terms. – Originally congressional terms began and ended in March. 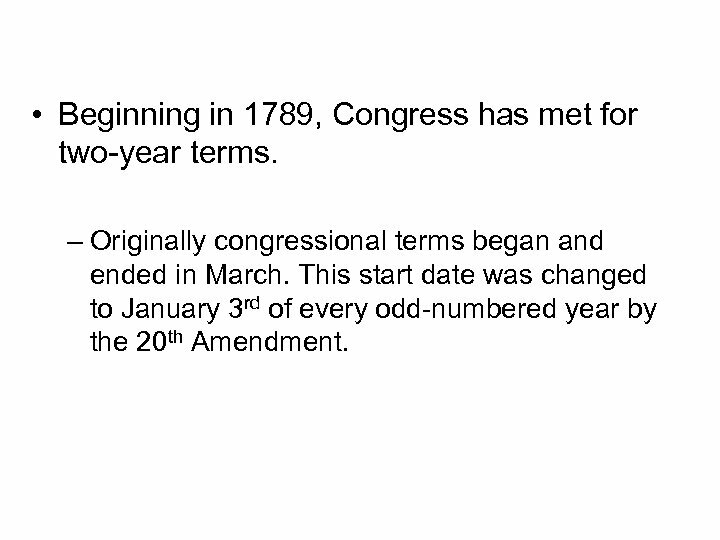 This start date was changed to January 3 rd of every odd-numbered year by the 20 th Amendment. 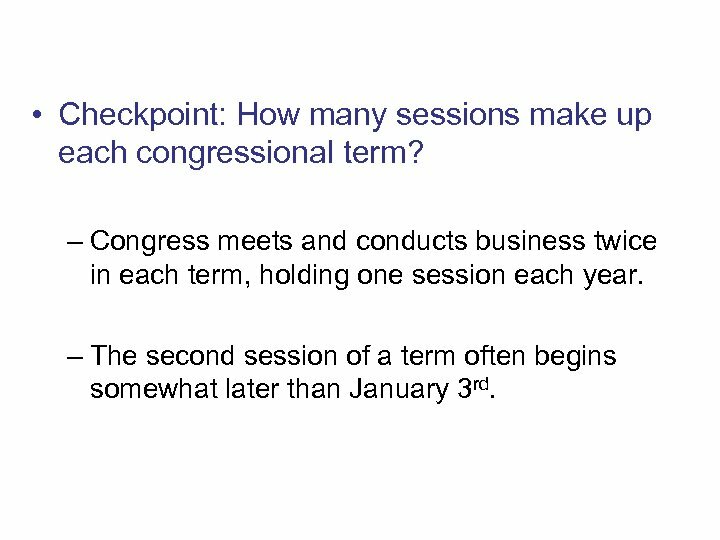 Congressional Sessions • Checkpoint: How many sessions make up each congressional term? 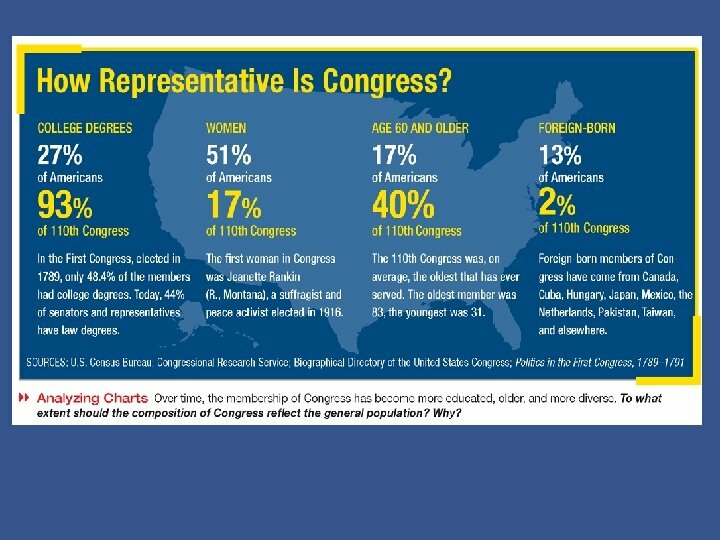 – Congress meets and conducts business twice in each term, holding one session each year. – The second session of a term often begins somewhat later than January 3 rd. 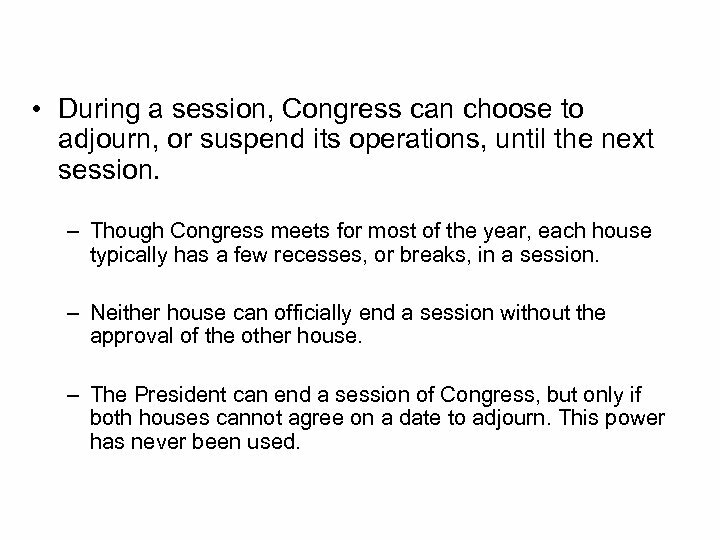 Adjourning Congress • During a session, Congress can choose to adjourn, or suspend its operations, until the next session. 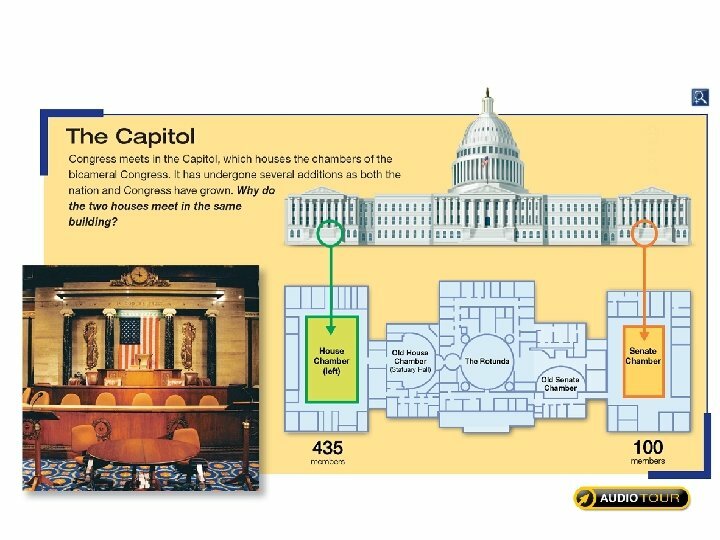 – Though Congress meets for most of the year, each house typically has a few recesses, or breaks, in a session. – Neither house can officially end a session without the approval of the other house. – The President can end a session of Congress, but only if both houses cannot agree on a date to adjourn. This power has never been used. 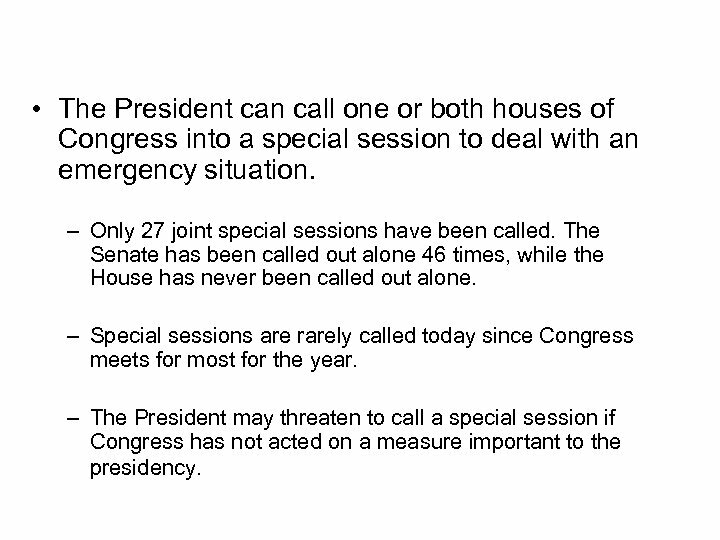 Special Sessions • The President can call one or both houses of Congress into a special session to deal with an emergency situation. – Only 27 joint special sessions have been called. The Senate has been called out alone 46 times, while the House has never been called out alone. – Special sessions are rarely called today since Congress meets for most for the year. – The President may threaten to call a special session if Congress has not acted on a measure important to the presidency. 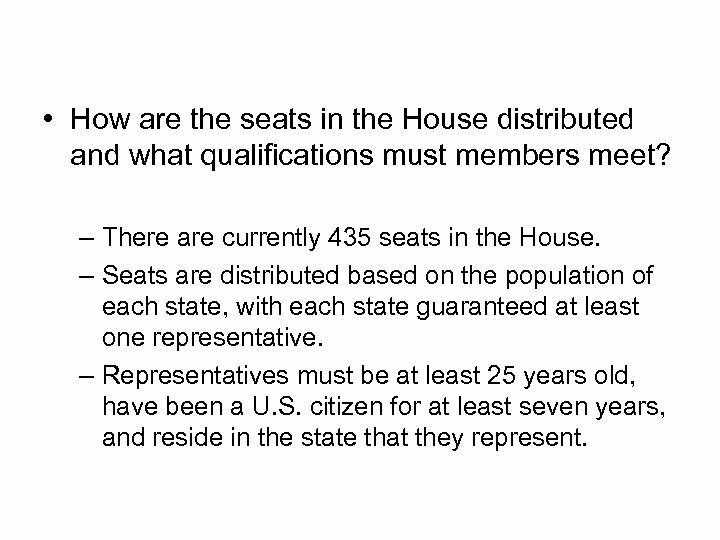 Introduction • How are the seats in the House distributed and what qualifications must members meet? 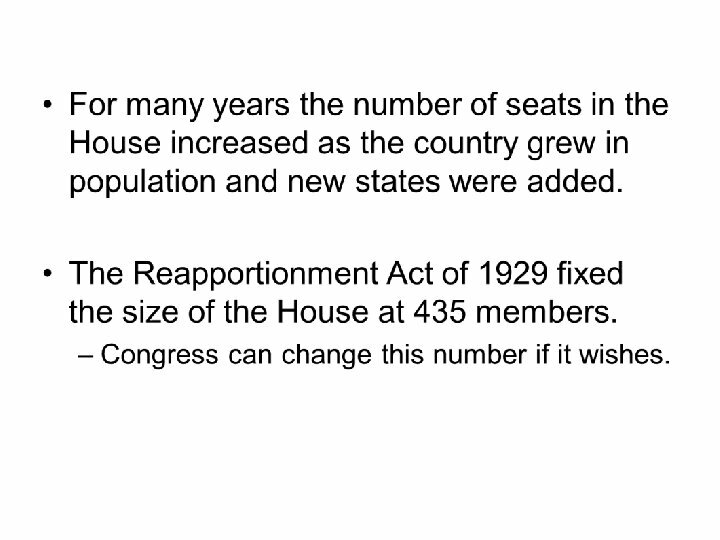 – There are currently 435 seats in the House. – Seats are distributed based on the population of each state, with each state guaranteed at least one representative. – Representatives must be at least 25 years old, have been a U. S. citizen for at least seven years, and reside in the state that they represent. 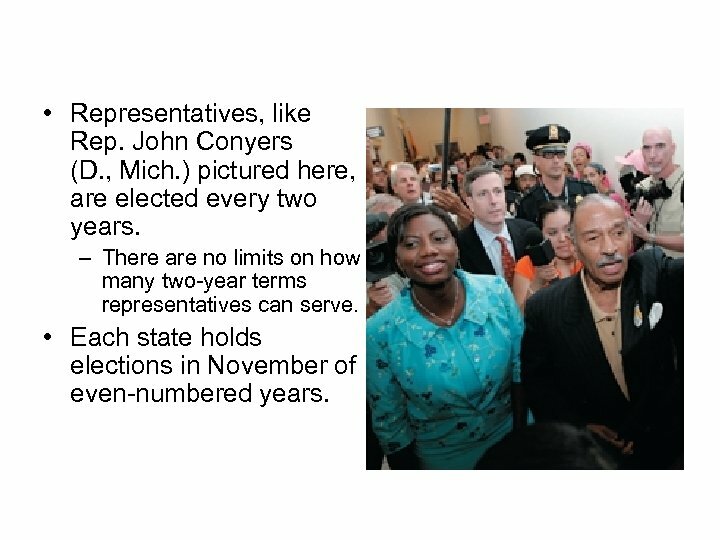 Congressional Elections • Representatives, like Rep. John Conyers (D. , Mich. ) pictured here, are elected every two years. – There are no limits on how many two-year terms representatives can serve. • Each state holds elections in November of even-numbered years. Congressional Elections, cont. • Elections held in nonpresidential years are called off-year elections. 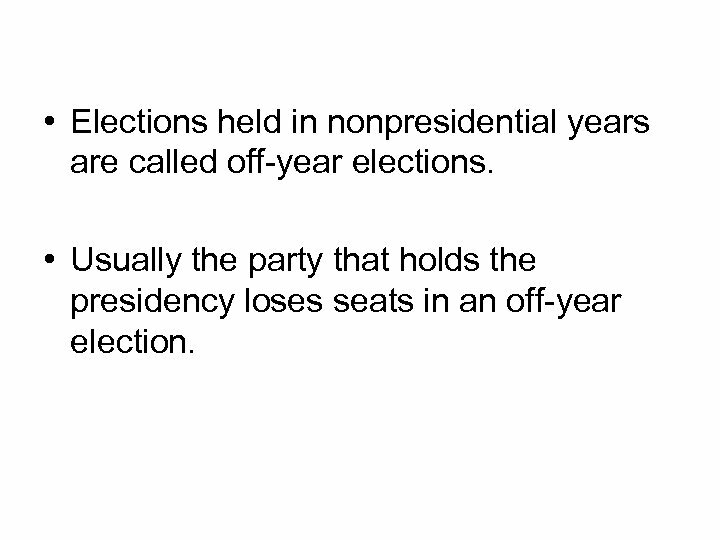 • Usually the party that holds the presidency loses seats in an off-year election. Formal Qualifications • Custom requires representatives to live in the districts they represent. 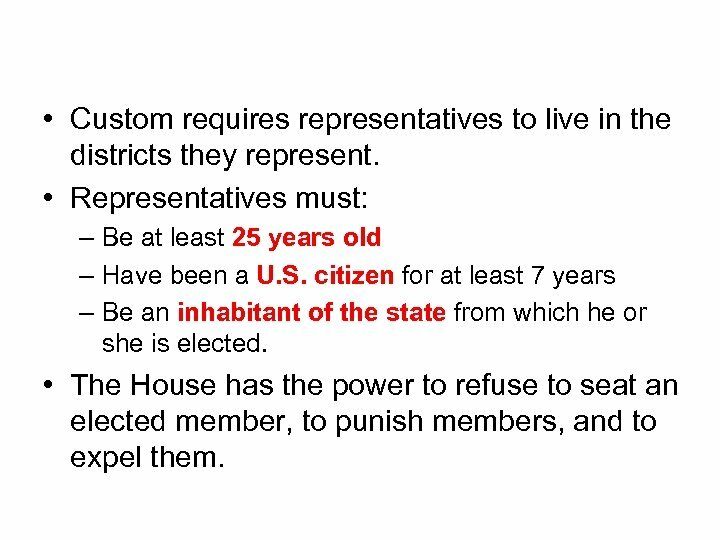 • Representatives must: – Be at least 25 years old – Have been a U. S. citizen for at least 7 years – Be an inhabitant of the state from which he or she is elected. 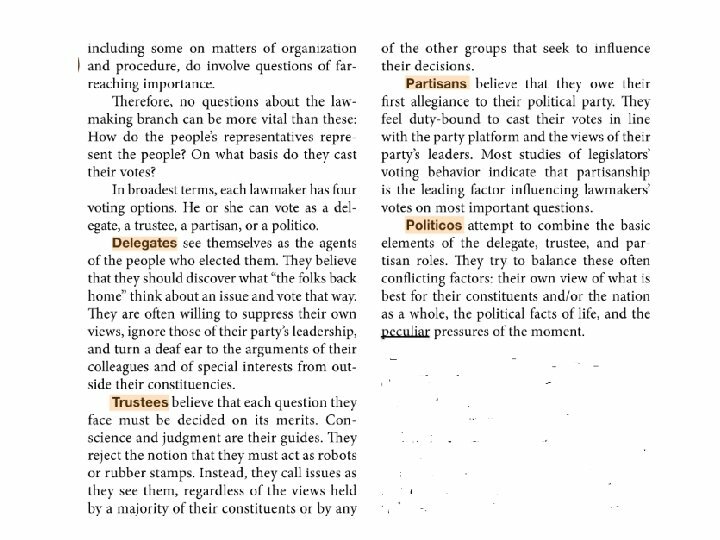 • The House has the power to refuse to seat an elected member, to punish members, and to expel them. 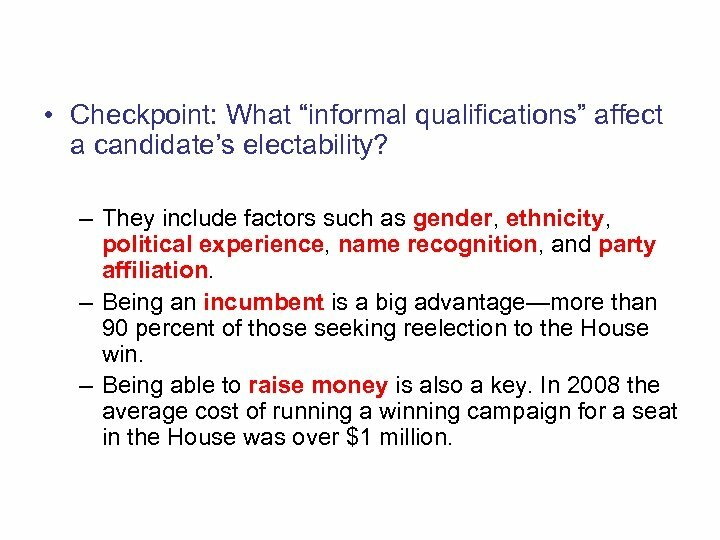 Informal Qualifications • Checkpoint: What “informal qualifications” affect a candidate’s electability? 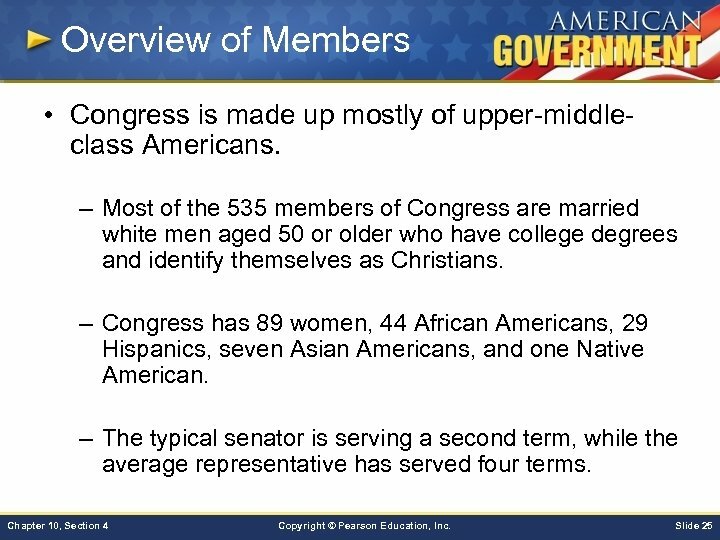 – They include factors such as gender, ethnicity, political experience, name recognition, and party affiliation. 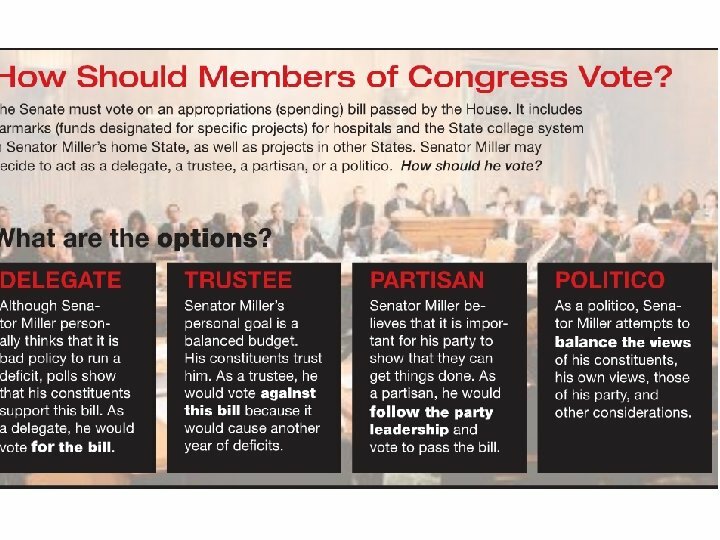 – Being an incumbent is a big advantage—more than 90 percent of those seeking reelection to the House win. – Being able to raise money is also a key. In 2008 the average cost of running a winning campaign for a seat in the House was over $1 million. 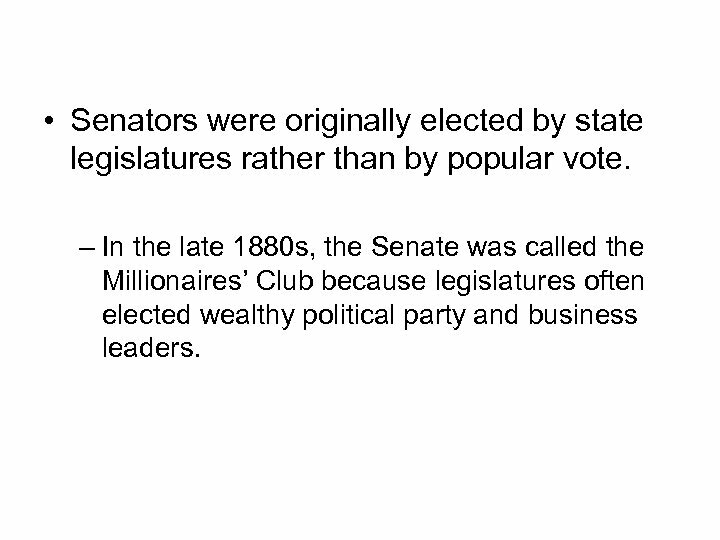 The Millionaires’ Club • Senators were originally elected by state legislatures rather than by popular vote. – In the late 1880 s, the Senate was called the Millionaires’ Club because legislatures often elected wealthy political party and business leaders. 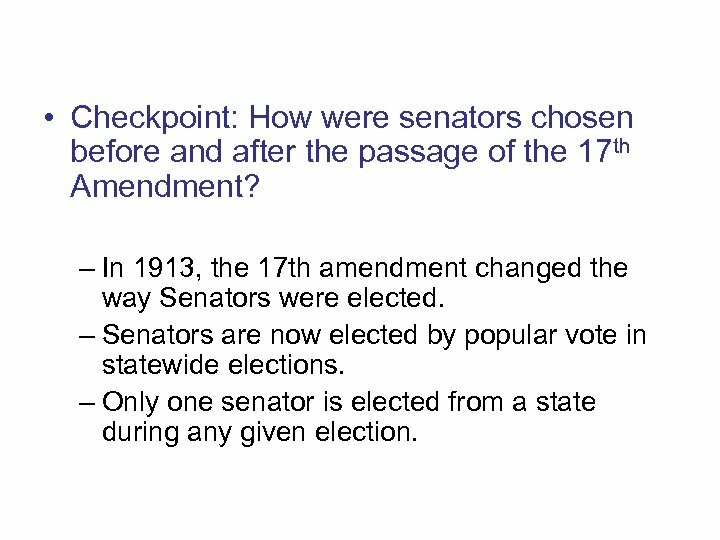 The 17 th Amendment • Checkpoint: How were senators chosen before and after the passage of the 17 th Amendment? – In 1913, the 17 th amendment changed the way Senators were elected. – Senators are now elected by popular vote in statewide elections. – Only one senator is elected from a state during any given election. 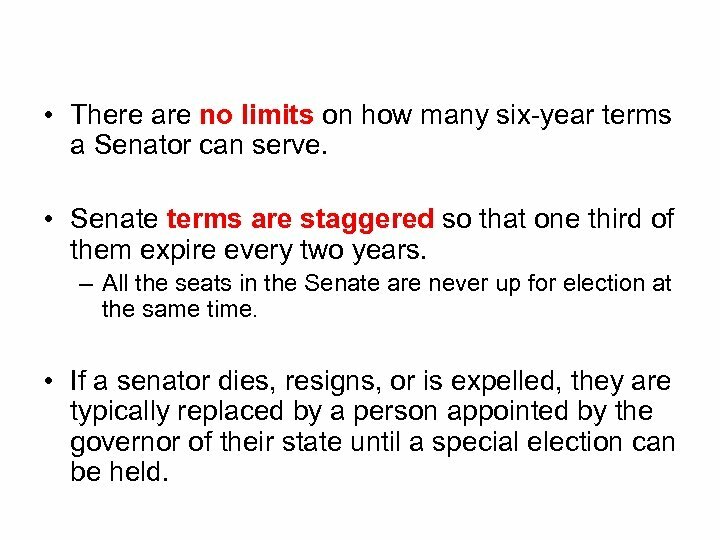 Senate Terms • There are no limits on how many six-year terms a Senator can serve. 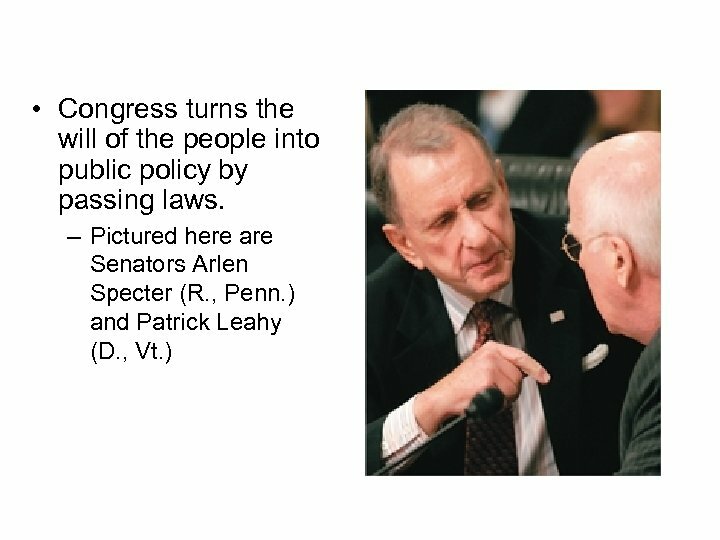 • Senate terms are staggered so that one third of them expire every two years. – All the seats in the Senate are never up for election at the same time. • If a senator dies, resigns, or is expelled, they are typically replaced by a person appointed by the governor of their state until a special election can be held. 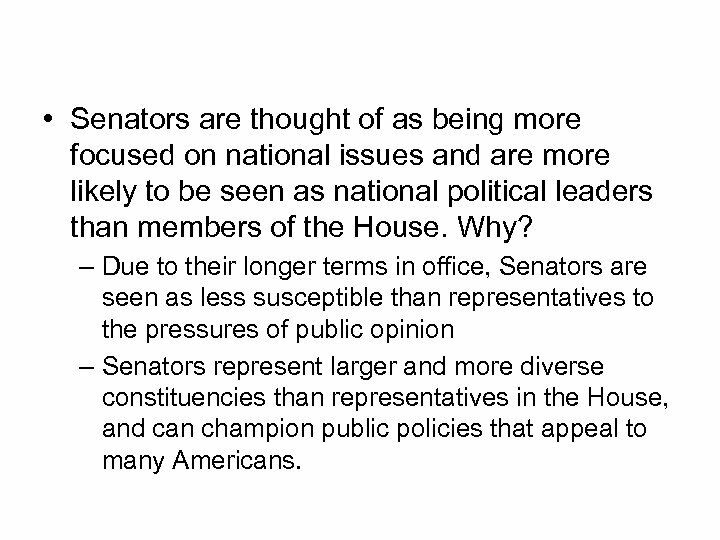 A Unique Role • Senators are thought of as being more focused on national issues and are more likely to be seen as national political leaders than members of the House. Why? – Due to their longer terms in office, Senators are seen as less susceptible than representatives to the pressures of public opinion – Senators represent larger and more diverse constituencies than representatives in the House, and can champion public policies that appeal to many Americans. 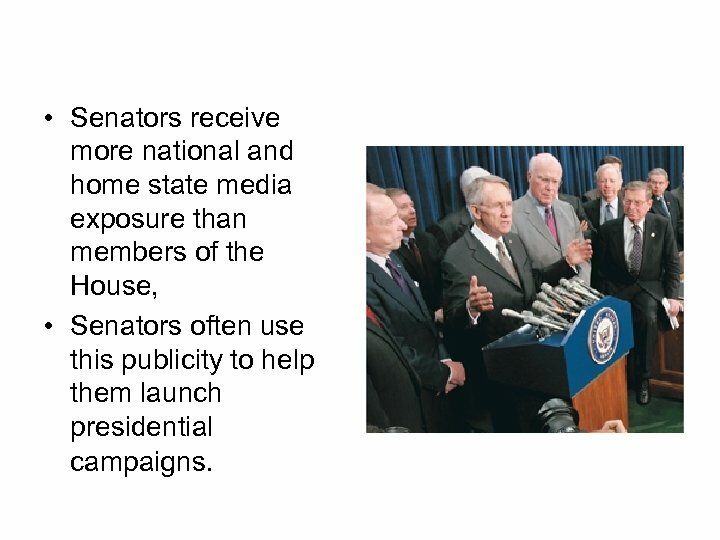 National Recognition • Senators receive more national and home state media exposure than members of the House, • Senators often use this publicity to help them launch presidential campaigns. 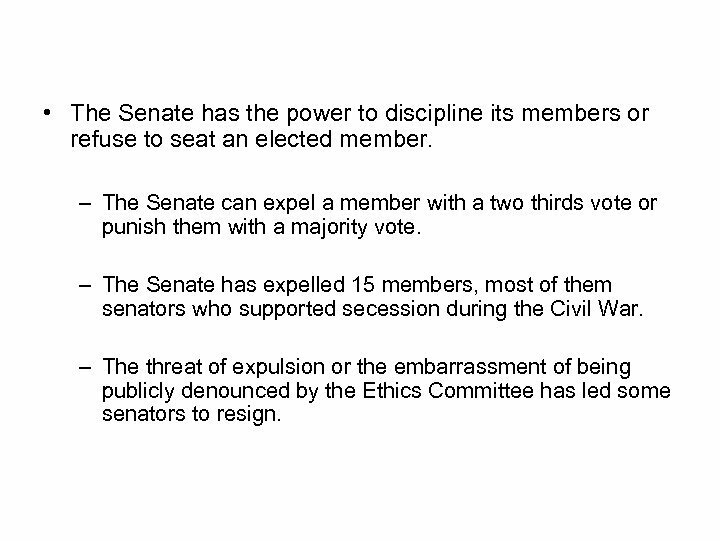 Senate Discipline • The Senate has the power to discipline its members or refuse to seat an elected member. – The Senate can expel a member with a two thirds vote or punish them with a majority vote. – The Senate has expelled 15 members, most of them senators who supported secession during the Civil War. – The threat of expulsion or the embarrassment of being publicly denounced by the Ethics Committee has led some senators to resign. S. E. A. 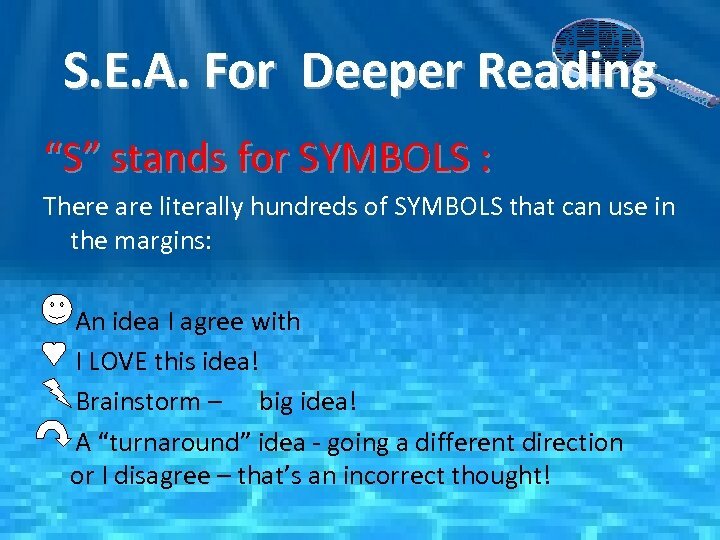 For Deeper Reading “S” stands for SYMBOLS : There are literally hundreds of SYMBOLS that can use in the margins: An idea I agree with I LOVE this idea! 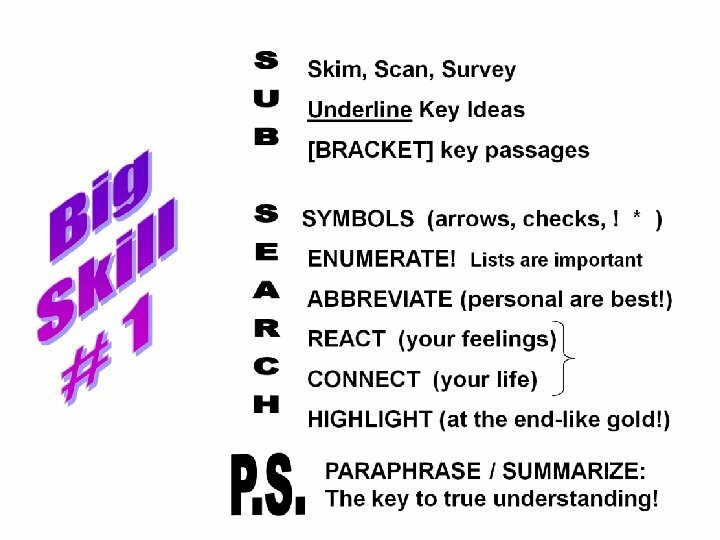 Brainstorm – big idea! A “turnaround” idea - going a different direction or I disagree – that’s an incorrect thought! S. E. A. 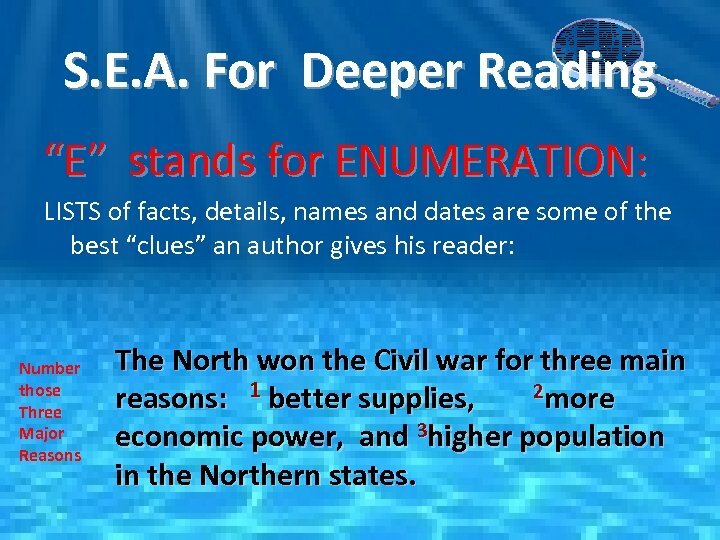 For Deeper Reading “E” stands for ENUMERATION: LISTS of facts, details, names and dates are some of the best “clues” an author gives his reader: Number those Three Major Reasons The North won the Civil war for three main 2 more reasons: 1 better supplies, economic power, and 3 higher population in the Northern states. S. E. A. 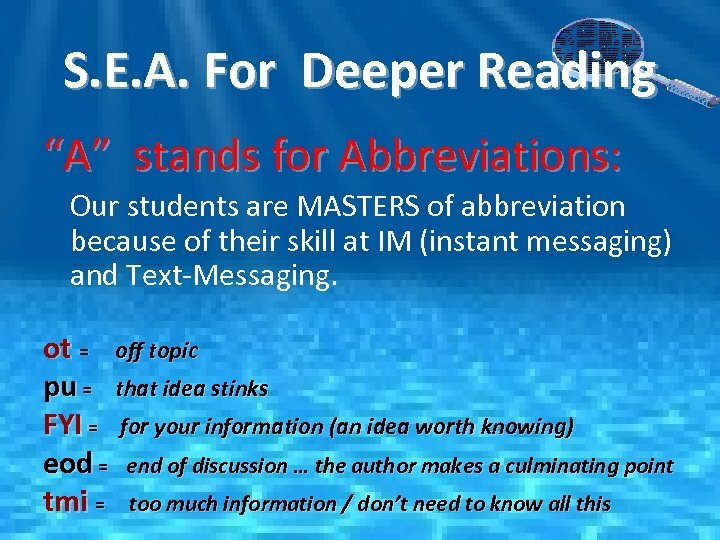 For Deeper Reading “A” stands for Abbreviations: Here are some of the most common IM and Text Message abbreviations – how can students use these to Sub. Search ? : o = I’m shocked by this idea! >: -( = -I’m annoyed with this author : ( = I’m disappointed / disagreeing : - ! = I’m very bored with this text ! 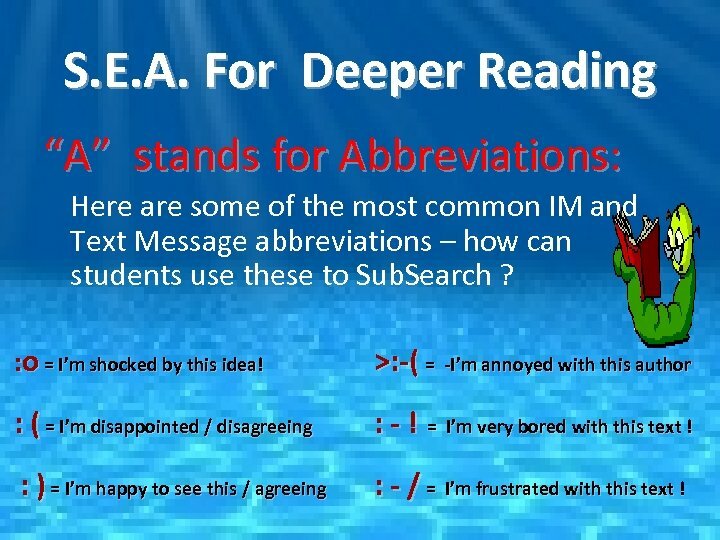 : ) = I’m happy to see this / agreeing : - / = I’m frustrated with this text !